Overview: An old Villian from Vance's future shows up, trying to alter the timeline to prevent someone from preventing something in the future - its gets muddled. Despero starts a plot to alter a potential future whereby he is defeated by Vance. Its a little muddled as to which future because Vance has already visited and adventured in the 30th Century, but its possibly another future prior to those future past adventures of Vance. Early August, 2014 - Returned from the Prison Break out (See Lady Martuk Plotline), and after the Sharks of Metropolis, the heroes are en route to Gotham (something about a possible techno-wiz to wiz-up the Ship). Jack is mindzotted and forced to attack Vance and Stargirl - they easily keep Flag off his feet. 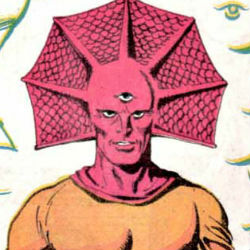 It is revealed that Despero is after Vance, using Jack as his muscle or his bait. Despero escapes from Metropolis with Jack as his puppet. The remaining duo go in search of a member of the serpent race of Thi-do-tek, who may have info on Despero or Jack, they visit the sewers. There they are interrupted by Death Head, also collecting on a Bounty against the Guardians. The robot is unaware of the power of Stargirl's forcefield, allowing the duo a chance to escape into dead space en route on the robot's ship. Acquiring a ship, en route to find Jack, the discover Despero has launched Jack back to earth - his body the vessel of a deadly extinction level virus for the human population. Jack was used for this purpose due to his enhanced stamina and regenerative ability. The group arrives and Stargirl is joined by Power Woman, Caitlin Fairchild, and Kyani Kohona in stopping both the large pod from damaging the city, as well as assisting in getting Jack under containment and to individuals perhaps capable of stopping the virus. Despero unheard of, the Guardians don't know what Jack has done. It seems he was used as muscle to unearth an ancient artifact that is used to light the Flame of Py'tarr. Starhawk arrives from the future, sensing this disturbance in the timeline, with a one use space/time portal to the Altar where the Flame is currently extinguished. The Guardians go and fight Despero along with Collapsar. Despero is chased away from the altar, Collapsar is defeated and the temple collapsed over the object that holds the Flame. The torch to light the flame is given to Starhawk of the future for safe keeping. To add a log, add 'gplot2' tag to the log.